On a day when the city of Chicago has officially lost its mind, considering raising the cost of riding the El during rush hours to $3.25 and Donald Trump wondering why no one wants to live in his eyesore hotel/apartment building, northern California quickly becomes attractive. I mean, UC Berkeley posts video program notes with pianist Sarah Cahill and composer Paul Dresher, Dresher's opera The Tyrant will open in June, and the San Francisco Symphony begins The Music of Prokofiev, a 10-day Prokofiev festival on June 14. Where else can you hear pianists Yefim Bronfman and Mikhail Rudy within five days? This RadiOM is also pretty darn fantastic, starting with Alan Hovhaness and building from there. (Cahill/Dresher tip via Richard Friedman). On top of the music, they also have nice weather, I'm told, and people tend to smile. Cahill discusses Frederic Rzewski's North American Ballads and Variations on The People United Will not Be Defeated!, smiling all the while. She still has the envelope containing the manuscript to Snippets 2, too, which Rzewski wrote for her. Of course, everyone's heard the minute-and-a-half podcast eighth blackbird did with Rzewski, right? Dresher's talk is a model of how to talk about music technically without losing 3/4 of the audience. Closer to home, there's some Holst-hatin' going on among eighth blackbird. Raising the Bard. Time Out Chicago, May 24, 2006. 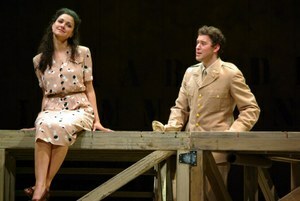 Chicago Opera Theater's, and Berlioz's, Beatrice et Benedict opened last night. Gaiety reigns supreme at the Harris Theater these days, now that Bluebeard's Castle and Erwartung have been replaced by Shakespeare's sparring lovers. Director Nicola Raab moves the comedy, drawn from Much Ado about Nothing, to World War II-era Sicily, where soldiers are taking a break. (I'm pretty sure they're supposed to be on the Allied side.) The women get sensible frocks and the men dun-colored uniforms, and the set is a raised wooden platform in the middle of the stage. It's all very utilitarian. Berlioz put together an effervescent opera at the miserable end of his life, something that puts him in a rather different category from other composers. (Slightly more on this in the article above.) He never had a single solution to expressing a dramatic situation, unlike most of his 19th century peers, which makes the text that much more important. This partially explains his open-minded championing of Verdi, Massenet, and Saint-Saens. He had no shorthand effects, no recitative to lean upon whatsoever, so singers and conductors have to be found who can get this across to an audience. Since the audience probably hasn't heard the work, Berlioz having as rough a time getting his operas performed today as he did when he was alive, this becomes doubly important. Following Berlioz's original knitting together of scenes, English dialogue taken from Shakespeare is interpolated into the action. Being no expert in these sorts of things, I though they handled it fine and projected their spoken voices into the cavernous hall with ease. Diction posed no problems, and neither did switching back and forth from French singing to English speaking for the audience. Raab cutesily adds another layer of linguistic fun, with characters spelling out their intents in English with oversized foam letters. The one weak spot is soprano Rinnat Moriah, who struggles with intonation and projection as Hero. Jan Latham-Koenig conducts a brightly lit and fast-paced performance that stays remarkably on track. Northwestern’s School of Music announced last week that incoming students could no longer enroll as Jazz Studies majors, or, less politely, that the Jazz program is being axed. Citing declining enrollment, dean Toni-Marie Montgomery said in a statement that “Most years, only two or three new students have enrolled.” The major was among the youngest on campus, having only been instituted in 1999. Predictably, this has raised the ire of those who did study jazz at Northwestern, and who don’t like seeing their program slapped around. They set up Friends of NU Jazz to defend the program and to organize letters to Dr. Montgomery. With letters of support from Jamey Aebersold, who basically founded the entire notion of jazz education through his jazz play-a-long recordings and summer jazz camps, to historians like Ted Gioia and musicians such as saxophonist Dave Liebman, it’s an impressive list. Chicago-based jazz pianist Dan Cray graduated from NU in ‘99, and made up his own jazz studies major while he was there, he wrote in an email. “[T]he program was rising—there were 2 big bands, and enough cats for 6-7 combos,” he continued. Cray plays regularly around here, holding down a Tuesday slot at the new Pops for Champagne downtown. Too bad—for musicians, for listeners, for Northwestern’s own students—it wasn’t rising fast enough. Addendum: The scholars of Destination Out have opened up their space to their Best Jazz of the '90s poll, to breathtaking results. The first three parts are up, with two more to come. Mania continues in the Windy City, so blogging will hold down its No. 2 seat for another few days (which is probably appropriate). To play catch up...the Chicago Symphony, conductor Alan Gilbert and pianist Olli Mustonen went flying off the rails in John Adams's Century Rolls last Thursday, hot on the heels of a drippy, unfocused performance of the brief Tromba Lontana. "Disaster," remarked my concertgoing friend after Century Rolls, and the lack of coordination between the sections of the orchestra showed he wasn't wrong. Tromba Lontana was its own sort of mini-fiasco, with Gilbert failing to bring any sense of transparency to the orchestra behind the solo trumpets; it all vanished into a mushy haze. For the sake of all involved, I was gladdened that Adams wasn't present. Tonight, Gilbert conducts the Civic Orchestra in Pictures at an Exhibition and Ravel's Rapsodie Espagnole; Beatrice et Benedict closes Chicago Opera Theater's season beginning Wednesday (more on that soon); more from Gilbert and the CSO Friday with Copland's Third Symphony; DePaul University's Contemporary Ensemble plays Steve Reich's Music for 18 Musicians a week from Tuesday. Those are the ones I can remember off the top of my head. "I just talked to Osvaldo [Golijov], and he said the IU Jacobs School of Music commissioned a violin concerto from him. It's for their new violin prof."
"Really? Something for Josh Bell?" "No, the other one, I think." "No, no. They asked him to 'reflect the soloist's biography,' he said, something like that. I think he said it's going to be called Streets of Jaime Laredo." Bluebeard's Castle—Erwartung. Time Out Chicago, May 17, 2007. Chicago Opera Theater's double-bill wows 'em. The magazine is short-staffed this week, so yours truly is stepping up and staring at his computer's monitor even more than usual. That's my excuse for not posting more lately. Be back soon, I hope.